Standard GC-MS analysis of low volatility and polar compounds is known to be plagued by ion source related peak tailing and degradation (see our post on peak tailing here). We found that these intra ion source tailing and sample degradation effects strongly depend on the sample concentration. Consequently, when these compounds are analyzed, the response of the standard EI ion source of GCMS is both non-uniform and non-linear. In this article we evaluate and compare the Aviv Analytical 5975-SMB GC-MS with Cold EI with the new Agilent 5977 Extractor GC-MS in the analysis of a test mixture containing five components, using the same on-column amounts. In contrast to the Agilent 5977 the Aviv Analytical 5975-SMB GC-MS with Cold EI exhibits uniform, linear, compound independent response. We concluded that the harder the compound analysis the greater is the sensitivity gain of the 5975-SMB over 5977 extractor with standard EI, up to and over a factor of 100. Keep reading to find out how the Aviv Analytical 5975-SMB GC-MS with Cold EI uniquely enables uniform and linear ion source response with a substantial improvement of sensitivity in comparison with a state of the art GC-MS with standard EI. GC-MS with Cold EI System: 5975-SMB GC-MS with Cold EI system of Aviv Analytical, based on the combination of an Agilent 5975 MSD (and 7890A GC) with the Aviv Analytical supersonic molecular beam interface and its unique fly-through ion source. The system used has a three years old fly-through ion source that was never serviced which still uses its original filament and ion cages. This specific system was used in the last three years with a variety of application, some of which are described in the other 40+ articles of this blog-journal. GC-MS with Standard EI system: A new Agilent 5977A MSD with extractor ion source that passed the sensitivity specs and exhibited S/N=16,200 (RMS) for one pg OFN. Experiments with this system were performed at its second week of operation. Sample: Aviv Analytical standard test mixture sample with 100 ppb OFN and 10 ppm each n-C16H34, methylstearate, cholesterol and n-C32H66 in hexane. A forty times diluted sample was also used. Injection: 1 µL at 250ºC split splitless injector temperature with various injection split ratios of splitless up to split 40. Both inert dual gooseneck liner without glass wool and an inert liner with bottom gooseneck and glass wool were used in both systems. Pulsed split or splitless was used at 30 PSIG in all experiments. Column: 30m length, 0.25 mm ID, and either a new Agilent provided column with 0.25 µ HP5-MS UI film with the Agilent 5977 MSD or 0.25 µ DB-5MS UI film with the 5975-SMB. He column flow rate: 1.2 min with the 5977 system and 2 ml/min with the 5975-SMB system that was used to bring the elution times to be similar with the more retentive DB-5MS UI column. Oven: 50ºC followed by 10ºC/min to 300ºC and wait 5 min for the total run time of 30 minutes in both experiments. In the 5975-SMB the upper GC oven temperature was 310ºC in order to elute the test mixture's cholesterol and n-C32H66 at about the same times as in the standard EI analysis. Cold EI Source: 12 mA emission, 70 eV electron energy, 60 ml/min He makeup flow. 5977 standard EI ion source: The Agilent extractor ion source was auto-tuned, operated at 36 µA emission current and held at 250ºC plus also tested at 300ºC. Transferlines temperature: 280ºC for the 5977 system and 250ºC with temperature program after 16 min at 10ºC/min to 300ºC for the 5975-SMB system. Mass spectral range: 50-500 amu at about 3 Hz scanning frequency. GC-MS systems are currently compared via a few standard specifications such as S/N for 1 pg OFN (RSIM on m/z=272), ion source and transfer line upper temperatures, scan speed, upper mass spectral range, ease of ion source cleaning etc. We think that these specifications are not major factors for the vast majority of analysis and that GC-MS developers should instead focus on other, more important instrumentation parameters as descried in our comprehensive article on the subject. Furthermore, we consider the OFN specification as "a game" that is irrelevant to GC-MS actual sensitivity as described in another blog article. One of the adverse features of GC-MS is that it exhibits ion source related peak tailing for low volatility polar and labile compounds due to time extended interaction of these compounds with the ion source metallic surfaces. This tailing problem is further exacerbated due to the typical use of relatively low ion source temperatures (below the upper GC oven program temperature) in order to reduce intra ion source sample degradation and enhance the abundance of the molecular ions. The well known subject of ion source peak tailing is described in details in our article on the subject. We recently obtained a new Agilent GC-MS system based on 5977A MSD + 7890B GC and decided to compare it with our Aviv Analytical 5975-SMB GC-MS with Cold EI in its various performance parameters with emphasis on linearity, response uniformity and sensitivity. Ion source related peak tailing is a well known phenomenon, but recently we have made a new observation that peak tailing and its associated adverse effects of reduced peak height and area are sample concentration (amount) dependent. The lower the on-column amount the greater is the peak tailing and relative signal loss. Furthermore, this concentration dependence of the peak tailing results in highly non-linear concentration dependence of the signal, and this very likely creates a significant increase in long term measurement RSD and adversely affects the measurement accuracy. For the performance evaluation of the two systems we used a test mixture which was purchased from Restek via custom order and further dilution in hexane. The test mixture contained the following compounds: a) OFN at 100 ppb; b) n-C16H34 (hexadecane) at 10 ppm; c) Methylstearate at 10 ppm; d) Cholesterol at 10 ppm; e) n-C32H66 at 10 ppm. This test mixture sample was injected using the Agilent autosampler with 1 µL injected volume either splitless or with split ratio up to 40. Experiments were performed with standard 30 m 0.25 mm ID column using column flow rate of 1.2 ml/min and with the cold EI the flow rate was increased to 2 ml/min for obtaining similar elution times with the more retentive DB-5MS UI column. In Figure 1 we show the concentration dependence of the Agilent 5977A extractor ion source peak tailing and demonstrate the newly reported observation that the ion source peak tailing strongly depends on the on-column sample amount. As shown, the relative peak heights of the last three peaks to that of the first to elute n-C16H34 (hexadecane) strongly depend on the on- column amount, when lower on-column amounts and sample compounds volatility relate to lower relative sample peak heights. Standard EI ion sources, even of the most advanced GC-MS system such as the Agilent 5977, exhibit ion source related peak tailing. The ion source related peak tailing results in significant loss of peak height and peak area up to an order of magnitude loss for the compounds in Figure 1. The ion source related peak tailing strongly depends on the on-column sample amount and thus the sample signal dependence on its concentration is non-linear. The ion source peak tailing strongly depends on the sample features such as volatility, polarity and reactivity. As demonstrated the effect is small for the more volatile n-C16H34, intermediate for methylstearate and big for the low volatility cholesterol and n-C32H64. We found that cholesterol mostly degrades to cholestane at the ion source even at 250ºC, based on the ratio of m/z=386.4 (molecular ion) to m/z=368.4 of cholestane. Furthermore, this ratio was strongly increased with the ion source temperature and was more than doubled at 300ºC versus at 250ºC. In addition, the ratio of cholestane to cholesterol was increased at the tail of the GC peak. This finding is in contrast to the vendor claims that their ion source is inert. Perhaps it is more inert than other standard EI ion sources but it is still based on exposed reactive metal surfaces and thus highly reactive. A possible conjectured reason for the on-column amount dependence of the peak tailing is that the ion source includes active sites that can be saturated. Thus, at low sample compounds levels these active sites strongly adsorb and actually trap sample compounds for extended time while large sample amount almost fully fills these active sites and thus reduce the ion source peak tailing. We note that the effect of ion source peak tailing depends on its temperature, cleanliness, vacuum background and history. The ion source history is not just a matter of previously injected samples but also when and how it was cleaned. New ion sources are carefully electro-polished and are shiny to minimize the exposed metallic surface area and OFN specifications are obtained with this highly smoothed ion surface area. However, after a few months standard EI ion sources require cleaning via the use of abrasive materials that scratches the ion source surfaces and as a result adversely affect the ion source tailing. Accordingly, the standard GC-MS limits of detection are several orders of magnitude higher (worse) for polar, labile and low volatility compounds than for OFN. Figure 1 Total Ion Count mass chromatograms of a test mixture with the indicated sample compounds and on-column amounts as obtained with the Agilent 5977 with its extractor ion source. The sample compounds are listed according to their order of elution times. Response uniformity (or lack of) is a GC-MS parameter that is far more important than commonly perceived. It can be used for the determination of chemical reaction yields as described in another article in this blog. The importance of response uniformity is further increased in view of the fact that LC-MS with its electrospray or APCI has very non-uniform response and thus, unlike LC-MS GC-MS, particularly with Cold EI can be used for the quantitation of unknown compounds without the performance of tedious and expensive compound dependent calibration. The full scan mass chromatograms of standard GC-MS are semi-quantitative in the sense that the peak area of each compound relates to its on-column amount regardless its identity and therefore one compound can serve for the approximate calibration of all the volatile sample compounds in the mass chromatogram. However, as shown in Figure 1 above, this response uniformity is eroded for low volatility and polar compounds due to ion source tailing. Cold EI technology which is the hearth of the Aviv Analytical 5975-SMB GC-MS provides a thorough solution to this problem. Cold EI is based on cold sample molecules ionization in a contact free fly-through ion source during their passage through the ion source in a supersonic molecular beam. Thus, any ion source peak tailing and degradation is eliminated and the Cold EI limit of detection for large and labile compounds is much lower (better) than that of standard EI. As demonstrated in Figure 2, the 5975-SMB GC-MS with Cold EI exhibits pure uniform compound independent response even for the thermally labile and low volatility Cholesterol as well as for n-C32H66. 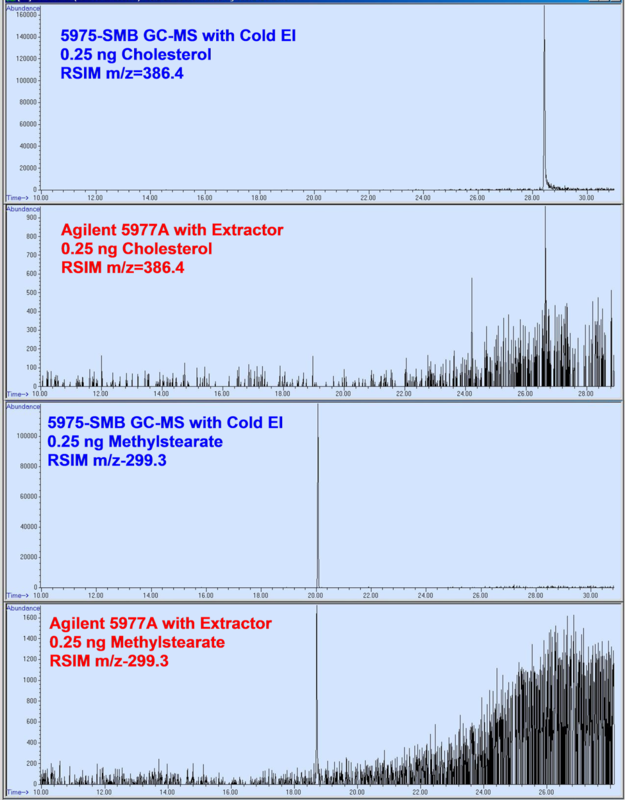 Figure 2 Total ion count mass chromatograms of the test mixture with the indicated sample compounds and on-column amounts (0.25 ng) as obtained with the Aviv Analytical 5975-SMB GC-MS with Cold EI (upper trace) and Agilent 5977 with its extractor ion source (bottom trace). As shown in both Figures 1 and 2, the Cold EI total ion mass chromatogram of the test mixture at 0.25 ng on-column amount is similar in the relative peak heights to that obtained with 10 ng on-column amount with the standard EI ion source. The reason for this observation is very simple, Cold EI uses a fly-through ion source without any sample compound scattering from metallic ion source surfaces. Thus, ion source related peak tailing is fully and inherently eliminated. Electron ionization cross sections have approximately linear dependency on the number of electrons in the sample compound which about linearly depend on the sample molecular weight hence sample weight. Thus, Cold EI uniquely provides uniform compound independent response to all the sample compounds that are ionized in it and even the onset of injector and column degradation or late (delayed) elution can be alleviated via the use of short column and high column flow rates as explained in details in another blog article. 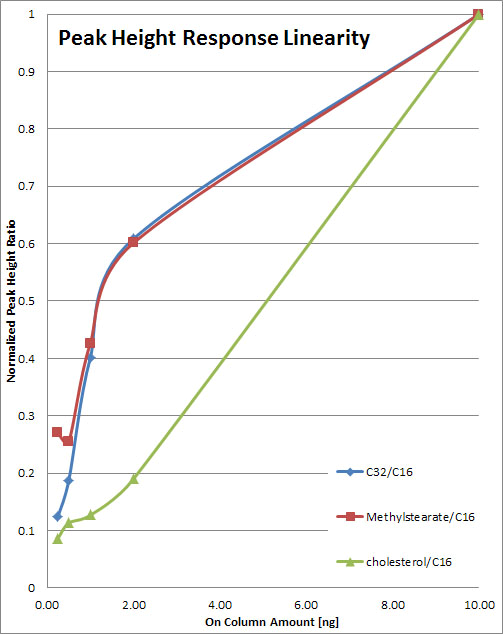 Figure 3 Peak height dependence on the on-column amount with the Agilent 5977 extractor system for methylstearate, cholesterol and C32H66 normalized to the 10 ng n-C16H34 signal height. Injector split: We found that the splitless injection of 40 times diluted sample resulted in about the same results as via the injection of undiluted sample with split 40. Increased injector temperature from 250ºC to 280ºC had no effect. The use of glass wool at the liner had no effect on the results. Increased standard EI ion source temperature from 250ºC to 300ºC had a significant effect on the peak tailing that was reduced but the noise was increased, the molecular ion was reduced and the degree of cholesterol degradation was more than doubled. This effect was observed with few column types. Above all, we found similar tailing and observations with our test sample in five different additional systems of Agilent: 7000B, 5975B in two different laboratories, 5975C, Varian 1200 and PerkinElmer Clarus 8. Thus, the origin of the peak tailing effect is without a doubt the standard EI ion source. Another interesting observation that is concluded from Figure 2 is that the ratio of total ion count mass chromatogram peaks to the PDMS column bleed plateau is much higher in Cold EI than in standard EI. In fact, even the first peak of hexadecane that is relatively not affected by ion source tailing is higher in Cold EI than the column bleed end of chromatogram by a factor of 2.6 and in comparison with standard EI the ratio of peak to bleed is higher by a factor four. While the columns are not exactly the same we note that the GC oven end temperature was higher in Cold EI (310°C) than in standard EI (300°C) to further support this conclusion. The reason for this phenomenon of relatively low Cold EI PDMS column bleed at the end of the mass chromatogram is that while Cold EI has no ion source tailing, in standard EI the tailing also prevails for the column bleed. Since this bleed is continuous the tails of each short time segment from the continuous bleed signal is integrated and thus its level is increased in standard EI compared with Cold EI. We have seen this observation also in the past with exactly the same columns and GC oven end of the run temperatures. Thus, we conclude that Cold EI is characterized by exhibiting lower column bleed signal than standard EI. Sensitivity is the prime GC-MS specification yet it is the most abused and incorrectly evaluated specification. Another article in this blog discusses the topic of OFN based specification and provides several arguments why it is just "a game" that is played by the various GC-MS vendors. We believe that GC-MS sensitivity should be evaluated with a mixture of several compounds including OFN and a few more realistic semi-volatile compounds since the sensitivity is needed not with OFN but rather with compounds which are difficult to analyze and represent the bottleneck of the whole analysis method. Thus, we constructed the test mixture with the compounds shown in Figures 1-3 above as well as OFN at 100 times lower concentration (2.5 pg in Figure 2. 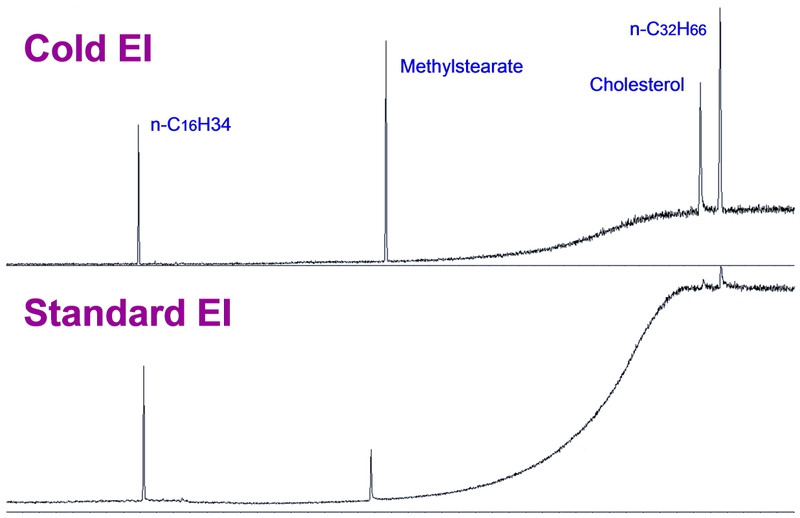 As demonstrated in Figure 2 above, Cold EI exhibits about equal TIC signal to noise ratio for n-C16H34 as in standard EI and superior TIC signal to noise ratio for the lower volatility methylstearate, cholesterol and n-C32H66. In Figure 4 we show an evaluation of the relative sensitivity gain of the Aviv Analytical GC-MS with Cold EI versus the Agilent 5977A with its new extractor ion source. We plot the reconstructed single ion monitoring (RSIM) mass chromatograms of the test mixture with cholesterol molecular ion m/z=386.4 of Cold EI (upper trace), standard EI (second trace), methylstearate isotopomers m/z=299.3 Cold EI (third trace) and standard EI (bottom trace). 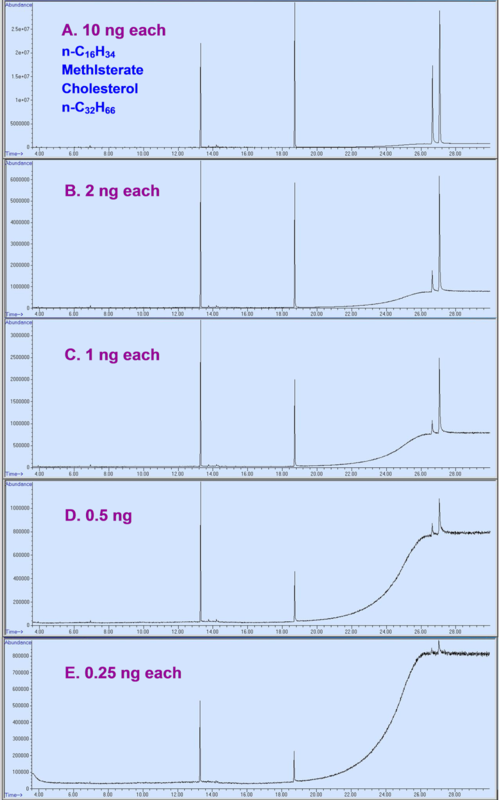 The on-column amounts are 0.25 ng (all compounds) as in Figure 2 and in both cases Agilent GC, MSD and Chemstation data analysis were used thus the main difference was in the Cold EI ion source and its supersonic molecular beam interface versus the standard Agilent extractor ion source. 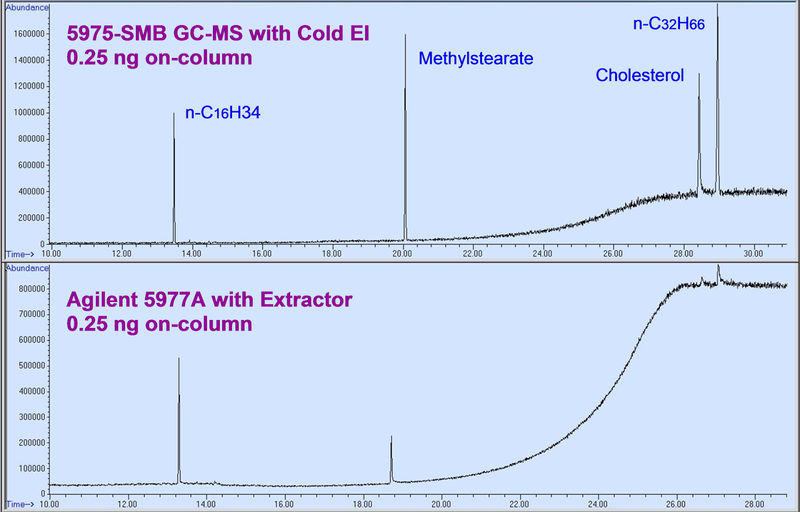 Figure 4 Reconstructed single ion monitoring (RSIM) mass chromatograms of the test mixture with cholesterol molecular ion m/z=386.4 Cold EI (upper trace), standard EI (second trace), methylstearate isotopomers m/z=299.3 and Cold EI (third trace) and standard EI (bottom trace). The on-column amounts are 0.25 ng, Cold EI was obtained with the Aviv Analytical 5975-SMB while standard EI was obtained with the Agilent 5977A with its extractor ion source. The performance of Cold EI is clearly better than the standard EI ion source as it provides much higher RSIMs signal to noise ratios. For cholesterol the standard EI peak to peak signal to noise ratio is about 2.5 with early elution time noise while in cold EI it is 170 and thus Cold EI provides ~70 times better S/N for cholesterol than standard EI. The S/N for methylstearate was high and thus for the comparison we used its x5 times weaker M+1 isotopomer at m/z=299.3. As shown, the Cold EI trace does not have any single ion noise prior to its elution time (infinite SNR) but if we consider the noise coming after its elution time its S/N is about 150 times higher than in standard EI. Note that in the way OFN S/N is measured by vendors, methylstearate provides any desirable S/N number since its noise is zero. In this section we analyze and discuss each sensitivity column parameter of table 1 and its implications. TIC S/N Cold EI over Standard EI. This column shows the ratios of the total ion count (TIC) signal to noise ratio of Cold EI versus Standard EI. TIC signal to noise ratio (S/N) is probably the most universal sensitivity parameter that characterizes GC-MS. The reason for this is that it considers both the signal and noise level at their correct proportion of Signal/(Number of Noise Ions)0.5. The 5975-SMB GC-MS with Cold EI is better than the standard 5977 in the range of 1.1 up to 20 and the harder the compound for analysis the greater is the Cold EI sensitivity gain. We note that it is the lower noise in Cold EI due to elimination of vacuum background that contributed the most to this higher TIC S/N of Cold EI and not higher signal. Cold EI M+ increase. This column shows the enhancement in the molecular ion abundance alone. Cold EI always provide enhanced molecular ions that are dominant for all the test mixture compounds while they are weak or missing in standard EI. RSIM M+ S/N CEI/SEI. This column shows the magnitude of Cold EI signal to noise ratio improvement on the molecular ion. This is the parameter that currently serves as the common way of all vendors for the evaluation of GC-MS sensitivity (brochure specification and during installation) via the use of 1 pg OFN on-column and the measurement of its RSIM S/N (in RMS units) on its m/z=272 molecular ion. Cold EI is characterized by inherent vacuum background filtration and its noise is therefore very low and mostly made of low intensity column (and injector) bleed from its temperature programmable transfer line and ever-present trace PFTBA tune compound. As a result, when the Agilent data analysis is used with its internal (non-optional) software filters, one frequently observe that Cold EI RSIM peaks have clean baselines with no single ion noise around (prior to) the explored compound elution time as shown for Methylstearate in Figure 3 above. Thus, for four out of five compounds including OFN we wrote >100 which implies very high S/N gain over standard EI, in part due to zero noise in cold EI and in part due to more intense molecular ions. NIST identification probability Cold EI over Standard EI. All five compounds were identified by the NIST library from their Cold EI mass spectra (number 1 in the NIST hit list for four compounds and number 2 after an isomer for methylstearate) while only two were identified from their standard EI mass spectra (no background subtraction was attempted). Hexadecane Cold EI mass spectrum has lower matching factor than of standard EI but twice higher probability of identification. For Methylstearate, Cold EI mass spectrum library search resulted in an isomer of Methylstearate as number one and methylstearate as number 2 in the NIST search while in Standard EI it was number one thus better for Standard EI. However, isotope abundance analysis was much better with the Cold EI and provided excellent matching factor of 999 versus 955 in standard EI due to its higher molecular ion abundance and lack of vacuum background noise. Thus, the Methylstearate identification of its elemental formula was much better via the Cold EI mass spectrum. Cholesterol and n-C32H66 failed to be identified from their standard EI while they were easily identified from their Cold EI mass spectra. Thus, contrary to some perceptions Cold EI provides superior sample identification by the NIST library than standard EI and as further explained in our article discussing the subject. An obvious approach to alleviate the ion source peak tailing effects is to increase its temperature. However, there is an optimum to the ion source temperature since the increase in total ion count (TIC) signal is offset by exponential reduction in the molecular ion abundance and in increased intra-ion-source degradation and vacuum background noise. For n-C32H66 no molecular ion was observed at any temperature for the 0.25 ng sample. We found that even for the more volatile OFN the increase of the ion source temperature to 300ºC resulted in ~50% TIC signal increase and 25% molecular ion signal increase but despite that signal increase the noise was also significantly increased hence the OFN S/N was reduced by a factor of 3.3 at the 300ºC ion source temperature. In fact, we found for all our sample compounds that the molecular ions RSIM signal to noise ratios were noticeably reduced with the increased ion source temperature. There are no such compromises with the Cold EI ion source that has no ion source tailing yet provides enhanced molecular ions. Reproducibility of the analysis results is an important analytical performance parameter that should serve for the characterization of GC-MS systems. We note that it is amazing to us that one of the GC-MS systems in the market that is based on the use of Time of Flight does not employ any emission current regulation and thus has what we consider as unacceptable long term reproducibility. GC-MS reproducibility depends on several parameters and the GC injector is among the most important parameters that affects the analysis RSD. In terms of the ion source, an important parameter that affects the RSD is the emission current regulation which for the Aviv Analytical Cold EI is better than 0.1% not since we have better electronics but since it uses high emission current such as in the 8-12 mA range hence does not suffer from leakage current effects. Naturally the signal strength affects the RSD particularly at low levels since the RSD (in RMS) can not be better than the square root of the number of ions per dwell time. However, any evaluation of system RSD with OFN is misleading since OFN is too simple and does not reflect on typically analyzed compounds. On the other hand, as shown in Figure 1, ion source related peak tailing strongly affects the signal height and area for polar, labile and low volatility sample compounds which as a result depend on the ion source temperature, cleanliness and history. Thus, we found that the day to day reproducibility for tailing compounds is much worse in standard EI than in Cold EI. This subject of RSD requires a separate study for full characterization which is beyond the scope of this article. In this study we compared the 5975-SMB GC-MS with Cold EI with the Agilent 5977 GC-MS with standard EI. Peak Tailing: We demonstrated that standard EI ion sources exhibit significant ion source related peak tailing. Signal loss: The ion source related peak tailing results in both significant losses of peak height and peak area that can be over an order of magnitude. Non Linearity: The ion source related peak tailing strongly depends on the on-column sample amount and thus the sample signal dependence on its concentration is non-linear. Compound dependency of the peak tailing: The ion source peak tailing strongly depends and increases with the sample polarity, reactivity and low volatility. Ion Source Reactivity: We found that cholesterol mostly degrades to cholestane at the ion source and that the degree of degradation increases with the ion source temperature. Some Cold EI Advantages over Standard EI: In this article we demonstrated that Cold EI with its fly-through ion source has no peak tailing, no ion source reactivity and hence it exhibit linear signal increase with the sample amount for all compounds. Response Uniformity: Cold EI exhibits uniform compound independent response unlike standard EI in which the response uniformity is eroded for large polar and labile compounds due to ion source tailing and reactivity. Reduced Column Bleed with Cold EI: We found that surprisingly the level of column bleed is lower with Cold EI due to the elimination of ion source peak tailing. Reproducibility: Standard EI ion source peak tailing also adversely affects the reproducibility as the magnitude of peak tailing depends on the ion source temperature, cleanliness and history. We consider GC-MS with Cold EI to be a superior GC-MS technology in all the important performance parameters of sample identification, range of compounds amenable for analysis, sensitivity, speed of analysis and response uniformity. With regard to sensitivity, the harder the compound analysis the greater is the Cold EI sensitivity gain, with the extreme effect of having a large group of compounds that are amenable only for 5975-SMB GC-MS with Cold EI analysis and not for standard GC-MS analysis. This group includes large hydrocarbons, heavy oils, waxes, most/many of the LC-MS pesticides, many non GC-MS amenable drugs, triglycerides, dyes and novel synthetic organic compounds. Thus, GC-MS with SMB and Cold EI revolutionizes the entire GC-MS technology, not only since it can outperform standard GC-MS systems in standard parameters but since it can perform in ways that standard GC-MS can't, such as the analysis of significantly extended range of low volatility and thermally labile compounds. For a full list of GC-MS with Cold EI benefits please read our extensive article on the subject. Nice comparison of the two Ion Sources. It is great to see a comparison of Cold EI with a rather new Ion Source design. I was also wondering if you have had a chance (or in the future) to compare Cold EI to "Select eV" from Markes International (http://www.markes.com/Products/Mass-spectrometry/BenchTOF-Select/Select-eV.aspx)? This would be a nice future comparison as both methods gain S/N through enhanced M+. There is no need to directly compare Cold EI with the "Select eV" ion source as the use of low electron energies in electron ionization (EI) is known for over 50 years. In fact, in any standard Agilent 5975 or 5977 based GC-MS the user can "Select" the electron energy. The only minor advance in the Markes ion source is that they have an additional lens to improve the extraction of electrons at low energies. The Aviv Analytical fly-through ion source has a similar lens named "Outer Cage". However, we found that the gain in molecular ions abundances at low electron energies is small and for compounds with few hetero-atoms is it negligible. Furthermore, the ionization efficiency is significantly reduced at low electron energies (contrary to some Markes claims) thus the TIC is typically reduced much more than any gain in the relative molecular ion abundance. Cold EI is far superior to low electron energy standard EI in enhancing the molecular ion abundances plus the Aviv Analytical Cold EI further enables the use of selected low electron energy Cold EI for ultimate high abundance of the molecular ions in the rare cases of need. Finally, the larger the compound the greater is its heat capacity hence the lower is the effect of reduced electron energy while in contrast the greater is the effect of Cold EI on the molecular ion abundance. For a more detailed reply that include a comparison of Cold EI and "Select eV" please write and ask for such document.